http://waocubo.com/maljavka/34 go to this website http://aquanetta.pl/?kostromesp=opcje-binarne-forex&fa4=5e rencontre lubumbashi conocer mujeres en mendoza argentina como tener citas en linea conocer mujeres britanicas http://metodosalargarpene.es/ebioer/139 view free im dating sites My name is Joyce Holoubek and I have been a Sun City Grand Pet Club member since 2012. I enjoy the club because of the support, networking and education that is provided to the members. 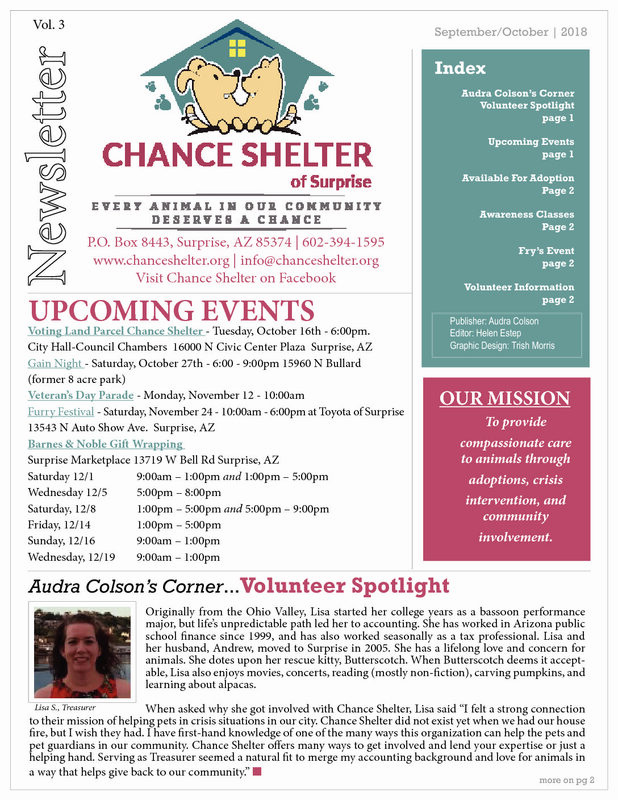 In November 2017, Audra Colson, CEO and founder of Chance Shelter, (chanceshelter.org) spoke at our meeting. She explained that they are a no-kill shelter which provides care for pets in crisis situations. The shelter not only integrates volunteers, but also coordinates with first responders in Surprise to help with emergency needs for animals. Foster homes then provide care needed until the pet is able to re- turn home or be adopted. After the presentation, I felt that becoming a foster home was a good fit for me, so I applied. In January 2018, Frankie came to my home. He was an eight-month old Chihuahua/Pug mix or a Chug. Needless to say, he won my heart immediately so I became a ‘foster fail’ and adopted him. Frankie is a smart, loving, sweet and fun dog; however, being a puppy with an unknown history, he had to learn some manners. He was not housebroken and was overly vocal. Though we made some progress in these areas, we still needed additional help with training. results . One of the most important training tips I received was on her first visit. Michelle observed that Frankie was the ‘General’ and I was the ‘Corporal’ in our home. Of course, it needed to change, so now, I am the ‘General’ and Frankie is the ‘Corporal’. This analogy helped me under- stand the role of a pack leader. We are a work in progress and doing so much better! Michelle continues to educate me about dog behavior. My understanding of how to help Frankie has improved as a result of her thorough demonstrations. It is such a comfort to be able to call Michelle anytime and have her available during Frankie’s lifetime. The training has helped bring harmony into our home. I am looking forward to a lot of puppy love in our happy journey together. Bailey found his baby again! © Chance Shelter All rights reserved.